Can I Give My Ferret Dry Cat Food? | Can i Give My Ferret? Can I Give My Ferret Dry Cat Food? Are you giving your ferret dry cat food? If you’ve been scouring the Internet finding out what ferrets eat, you’ll probably find that there has been a lot of talk if cat food is acceptable for ferret consumption. Ferrets are carnivores meaning they are meat-eaters. Ferrets require a balanced diet along with proper nutrition in order to avoid health conditions and premature death. Their diets need to be based on highly digestible animal meat/ protein with a high fat content and little to no carbohydrates. The easiest option for domesticated ferrets is dry food. The best dry food you can give your pet specially formulated ferret food because the nutritional content is made especially for the nutritional requirements of ferrets. Dogs, cats and ferrets have different nutritional needs. Ferrets have a more delicate digestive system as opposed to cats and dogs. Their highly carnivorous systems cannot digest the grains and vegetables that are oftentimes found in dog and cat food. In the past, it was common for pet owners to feed premium dry cat or kitten food. In the past, the science of pet nutrition was not as developed and many pet owners found it difficult to securing ferret food. However, now there is a variety of commercial ferret food that is available at local stores. For those who for one reason or another cannot avail of ferret food, another alternative many pet owners opt for is high quality cat/ kitten dry food that is available in pet shops, feed stores, as well as local veterinarians. 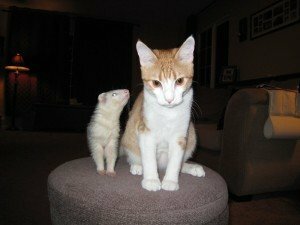 Most ferret foods are actually modified cat or kitten formulas that make it more expensive. It’s important to emphasize that the cat food must be high-quality and if you are opting to use alternative dry food, do not go for the cheap grocery or brand less food that would probably mix in a lot of non-nutritional ingredients. These “grocery store brands” typically are very poor for ferrets. Remember, you get what you pay for. It’s important that the dry pet food contains at least 32% to 36% protein with approximately 20% fat that is also low in carbohydrate content. It’s best to keep fiber at 3% or lower. Ferret dry food has a much higher protein content making it a bit more expensive. Some ferret owners use high quality kitten food and mix it with ferret food that will give a better nutritional value and reduce costs a bit. It’s important to make sure that cat food is not the main diet because it will not have enough protein for your pet. When your pet gets older, about 4 years or so, it is recommended that you then switch to adult cat food, allowing for the same high protein requirements of ferrets. Make sure that the new product is high in fat as well as low in grains, carbohydrates, sugar and fiber. Do not give your pet wet cat or dog food. This will not provide him the proper nutrients they require and may also lead to tooth decay. When feeding dry food, ensure that your pet has access to food at all times because ferrets do not overload on food and only eat according to their caloric need. They have short digestive tracts and fast metabolism that would mean they would feed frequently so dry foods are best to leave out and your pet will eat as necessary. Fresh clean water should always be available for the ferret. Ferrets can very quickly suffer from dehydration. Ferrets also imprint on their food during the first year of their life so try to ensure a mix of both kibble and meats so your pet will be accustomed to different flavors and textures. If you are planning to change your pet’s food, allow them to get used to the difference by transitioning their food. Slowly mix the new product with the old and increasing the amount of the new food and lowering the older product. Ferrets are picky eaters and you may find yourself with fussy eater when you surprise them with a quick change that they’re not used to or familiar with. Treats are not needed by ferrets but as a tool for training or just indulging your pet, it’s ok to give treats in moderation. However, be mindful never to give your pet something with a bone. You should avoid treats that are high in sugar because they have difficulty digesting sugar. No chocolates under any circumstances. Fruits and vegetables are difficult to digest as they don’t process fiber very well. They enjoy treats like raisins, peeled grapes, bananas and blueberries. Given their digestive difficulties, a good measure would be ½ teaspoon of treats only. Raw vegetables may cause blockages so refrain from this and too much fiber cause diarrhea and lead to dehydration.